If you have ever tried mapping a field with a drone, you will quickly find out that producing map-ready imagery of a farm field requires some amount of work and usually a trip back to the office. For this reason, drone systems have not been fully realized for crop scouting. Still, several companies have recently introduced software or applications that can create a real-time mosaic by using live pictures sent back to the tablet and assembling them into a mapped image as you fly. This map will have a lower resolution than the regular drone imagery, but it is still useful for most crop scouting purposes. Two pieces of software that offer this feature are DroneDeploy and Pix 4-Dfields. 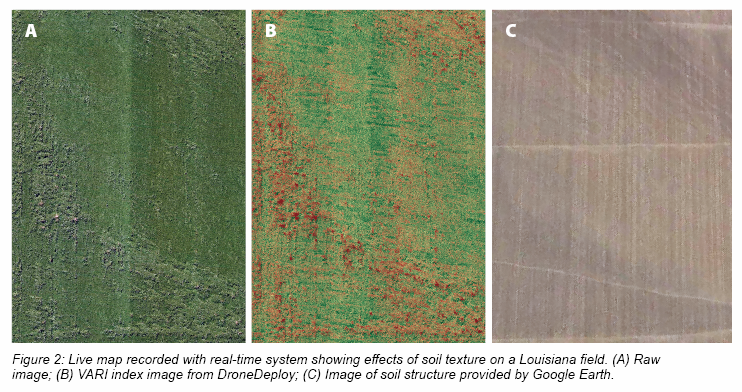 We have tested DroneDeploy quite extensively, and its mapping qualities are quite good (Figure 2) for crop scouting purposes; however, you may have to pay attention to camera setup and sunlight conditions for the best results. You will have to construct the system yourself because complete systems are not sold in a package. You will have to purchase a drone; a tablet, smartphone or laptop; and the correct software, such as DroneDeploy or Pix4-Dfields. 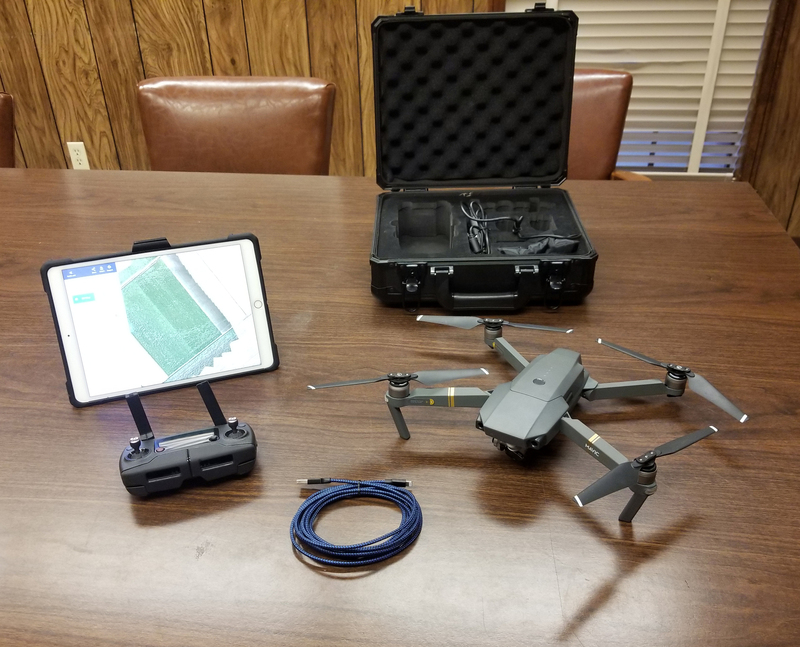 We have spent much time identifying the correct components with a total cost under $2,000 that produce good results, and the best components we found for this purpose were a DJI Mavic Pro (or a similar model), an Apple iPad or iPhone with cellular capabilities and DroneDeploy software (Figure 1). The DJI Mavic Pro is a small, easy-to-fly drone that is very powerful for its size. It can cover up to 100 acres of field area per flight at 400 feet. The Mavic Pro worked well for this because it has the radio components from the Inspire series that can provide high-quality, uninterrupted video at very long ranges, including those greater than 3.5 miles, which is necessary for real-time mapping operations. We were able to fly the drone from inside a vehicle, which allowed the tablet to be mounted inside the vehicle for cooling — a problem in the hot Louisiana weather. This also allowed easier viewing of the screen. Other drones may be substituted with good results for the Mavic Pro, such as the DJI Phantom 4, Phantom 4 Pro or Phantom 3 Advanced, etc., but the lower cost of the Mavic Pro is hard to beat. Note that some Mavic Pro drones have gimbal problems, so use the gimbal lock when not in use. The Mavic Air and similar drones may not be suitable for this operation because the radios do not have the range needed for mapping large fields. Also, you can use an extra-long USB cable between the tablet and transmitter to allow you to stand outside the vehicle while flying if needed. Use the main USB port located on the bottom of the Mavic Pro’s transmitter to transmit the video and make sure to completely unplug the side cable. Figure 1: Complete real-time mapping system: DJI Mavic Pro, case, Apple iPad, DroneDeploy and an extra-long lightning to USB cable. DroneDeploy is a cloud-based software and tablet app that is very easy to use. It does have a subscription fee ($89 per month) to use the “live view,” real-time map generation function, but you can try general field mapping for free. It is available in Android and Apple versions, but only the Apple version will run “live view,” which allows you to see a finished map at the end of the flight. Indices calculations can be performed, but sometimes this process takes five to 10 minutes after landing to complete. Testing with this system resulted in very good images (Figure 2), but camera adjustments and variances can have a large effect on the map, leading to interpretation errors. Still, the system worked well and was very useful in allowing full-field images to be created in the field. You could then take the tablet into the field and walk around to different locations inputting notes. Testing in one soybean field yielded very accurate results that matched actual variances very well. The Apple iPad is the other key ingredient to this system and is needed for the “live view” function of DroneDeploy to work. Note that you should purchase an iPad with cellular capabilities as these tablets have a built-in GPS sensor that will allow you to accurately locate areas in a field. Also, the Apple products efficiently connect between the tablets and drones, allowing you to easily flip and back forth between different apps, which is sometimes needed to set up a camera. A disadvantage of Apple tablets is that they can easily overheat in direct sunlight and turn off during flight, which can be unnerving. Also, sometimes they consume more power than the charging system can provide, causing the tablet to lose power during heavy use. Remember to always charge the night before. Using these components, a farmer or consultant can construct a system that will produce a real-time map of a farm field while at the field and then use that map for crop scouting. Remember that a Federal Aviation Administration remote pilot certificate is needed for commercial use, according to the FAA Small Unmanned Aircraft Systems Rule (Part 107 of Title 14 of the Code of Federal Regulations).